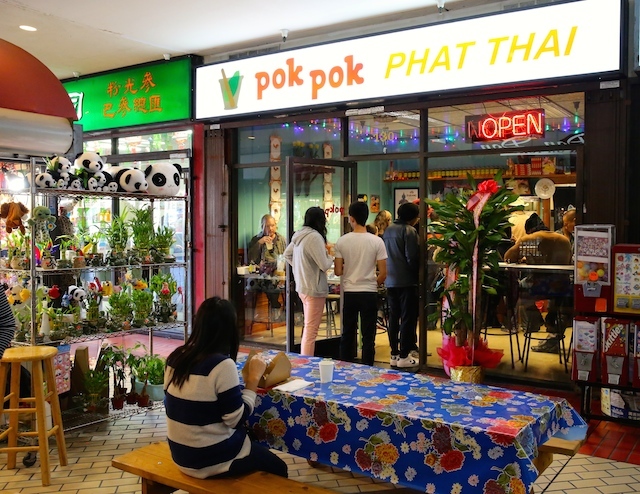 Pok Pok Phat Thai in Chinatown’s Far East Plaza will be shutting down indefinitely so that operators can focus on the nearby Pok Pok LA. The little restaurant will be closing on Sunday, according to Eater LA. The Portland-based eatery first debuted in L.A. via Pok Pok Phat Thai in December of 2014, joining Chego and Scoops in the Far East Plaza. Then, Pok Pok LA opened with a far more extensive menu in the Mandarin Plaza in October of 2015. Owner Andy Ricker confirmed the closure in an email to LAist, saying that they&apos;re "halting service" at Phat Thai while they reassess the space and focus on Pok Pok LA. However, they’ll still be around for "some pop-ups and events, like Chinatown Summer Nights." Far East Plaza has really boomed lately, drawing in Nashville&apos;s fried chicken spot Howlin&apos; Rays, Taiwanese street food spot Lao Tao, Ramen Champ and Alvin Cailan&apos;s Filipino eatery Amboy in recent times, so it&apos;ll be interesting to see what Ricker decides to do with the spot.